Hearts head coach Robbie Neilson and assistant Stevie Crawford have extended their contracts until the end of season 2017-18. Neilson won the Championship title in his first year in charge and the Edinburgh club currently sit third on their return to the top flight. "This is a win-win for everyone - the club, the players and the supporters," said chairwoman Ann Budge. "By continuing to pull together, I am confident we will achieve our goals." Neilson, 35, replaced Gary Locke as Tynecastle boss in the summer of 2014 following the club's administration and relegation from the Premiership. Working with director of football Craig Levein, Neilson and Crawford made sure of a swift return, losing just three Championship matches and finishing 21 points clear at the top. That good form has continued this term, with only five defeats in 25 Premiership games. "We came in with a long term plan, we're ahead of schedule and very happy with the progress our coaching team has made," said former Scotland boss Levein, who was manager at Tynecastle for four years before joining Leicester in 2004. 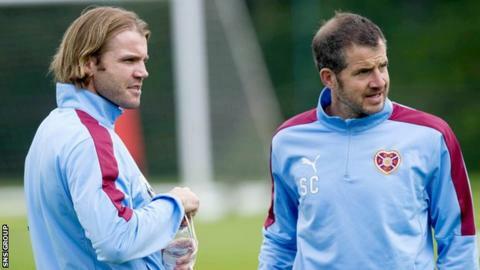 "Stevie and I are very happy to have extended our contracts," said Neilson, a former full-back who served as a Hearts player for a decade. "We are both young coaches with a lot to learn, and while we've enjoyed some real success, we want to deliver more for the supporters."